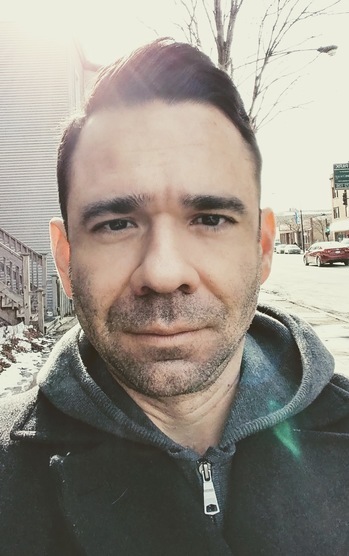 Juan Martinez is the author of Best Worst American, a story collection published by Small Beer Press and the inaugural winner of the Neukom Institute Award for Debut Speculative Fiction. He lives in Chicago and is an assistant professor at Northwestern University. 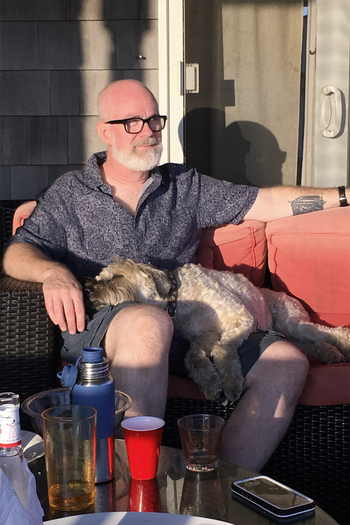 His work has appeared in many literary journals and anthologies, including Glimmer Train, McSweeney's, Huizache, Ecotone, NPR's Selected Shorts, Mississippi Review and elsewhere. Visit and say hi at fulmerford.com. Please join Juan and our other amazing readers on Tuesday, September 4, 2018 in the upstairs bar at Hopleaf. Doors open at 7pm, and the show starts at 7:30. It's free, and 21-and-over. Please RSVP on Facebook. William Shunn, a former Tuesday Funk co-host, is author of the memoir The Accidental Terrorist: Confessions of a Reluctant Missionary, not to mention more than three dozen short stories. His poetry has appeared in Sunstone, Analog, and Asimov's, and is forthcoming in Newtown Literary. His prose writing has been shortlisted for the Hugo Award, Nebula Award, Theodore Sturgeon Memorial Award, and Association for Mormon Letters Award. He lives in exile in New York City, where he hosts and produces the Line Break Reading Series, edits the online literary journal The Piltdown Review, and occasionally tells stories on stage. When not doing that stuff, Bill enjoys sneaking onto other people's television specials. Please join Bill and our other amazing readers on Tuesday, September 4, 2018 in the upstairs bar at Hopleaf. Doors open at 7pm, and the show starts at 7:30. It's free, and 21-and-over. Please RSVP on Facebook. Mare Swallow is the former Executive Director of the Chicago Writers Conference. Her essays have appeared in Story Club and Hypertext magazines. She is a contributor to Pop Mythology, and she tells her stories live at events such as Tuesday Funk and The Frunchroom. She has been named to New City's Lit 50 list three times. By day, she is a public speaking coach and professional speaker. She holds an MFA in Creative Nonfiction from Goucher College. She is one-half of the all-female, all-ukulele duo The Ukeladies. Please join Mare and our other amazing readers on Tuesday, September 4, 2018 in the upstairs bar at Hopleaf. Doors open at 7pm, and the show starts at 7:30. It's free, and 21-and-over. Please RSVP on Facebook. Tuesday Funk #120: We're 10 Years Old! A freak rainstorm may have scuttled our August show*, but nothing's going to stand in the way of our 10th anniversary show! (Holy crap, a decade worth of Tuesday Funk!? that's amazing!) 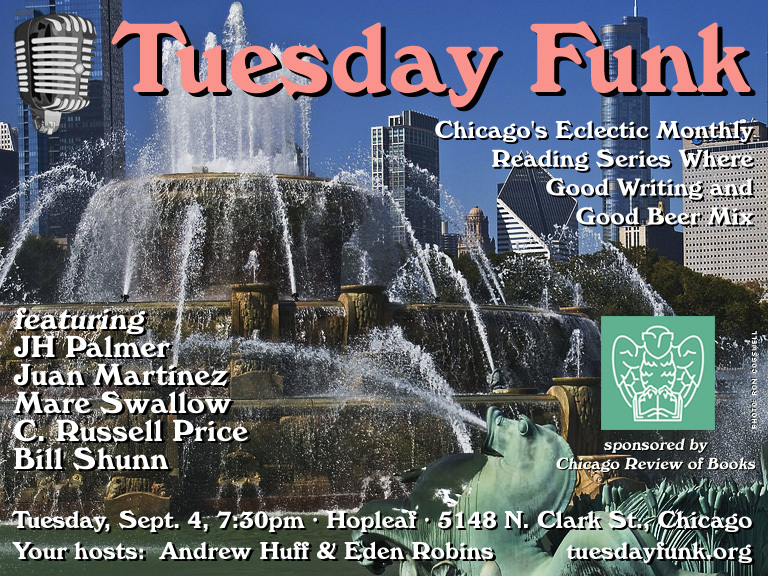 Join us in the upstairs bar at Hopleaf on Tuesday, Sept. 4 for readings by Juan Martinez, JH Palmer, C. Russell Price, Mare Swallow and former cohost Bill Shunn! As always, admission is free, but you must be 21 to attend. Doors open at 7pm sharp (be prompt if you want a seat!) and the show will start at 7:30pm. Please RSVP on Facebook -- and don't forget to like our page so you get our announcements right in your stream. * Oh, we're working to get the readers from our August episode into the calendar at upcoming shows, starting with Mare in this one. Stay tuned for more! Tuesday Funk #119 is tonight! UPDATE: Hopleaf lost power due to today's freak rainstorm, and unfortunately that means we have to cancel tonight's show. We're rescheduling the readers for future episodes -- stay tuned! Won't you join us for tonight's awesome show? We've got Mare Swallow, Dayna Bateman, Gina DeLuca, Annabel Lang and Kimberly Dixon-Mays! And of course, your favorite co-hosts, Andrew Huff and Eden Robins. Doors open at 7, hope to see you there! Mare Swallow is the former Executive Director of the Chicago Writers Conference. Her essays have appeared in Story Club and Hypertext magazines. She is a contributor to Pop Mythology, and she tells her stories live at events such as Tuesday Funk and The Frunchroom. 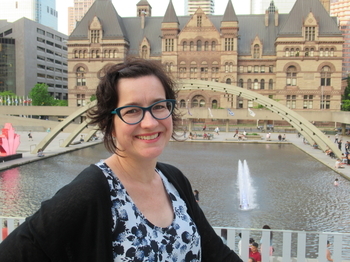 She has been named to New City's Lit 50 list three times. By day, she is a public speaking coach and professional speaker. She holds an MFA in Creative Nonfiction from Goucher College. She is one-half of the all-female, all-ukulele duo The Ukeladies. 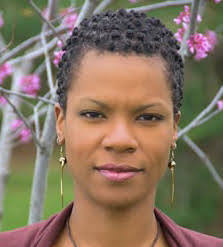 She will be a panelist at the Northwestern University Summer Writers' Conference on August 10. 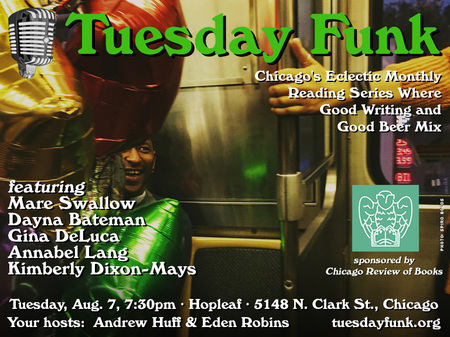 Please join Mare and our other amazing readers on Tuesday, August 7, 2018 in the upstairs bar at Hopleaf. Doors open at 7pm, and the show starts at 7:30. It's free, and 21-and-over. Please RSVP on Facebook. Please join Gina and our other amazing readers on Tuesday, August 7, 2018 in the upstairs bar at Hopleaf. Doors open at 7pm, and the show starts at 7:30. It's free, and 21-and-over. Please RSVP on Facebook. Please join Kimberly and our other amazing readers on Tuesday, August 7, 2018 in the upstairs bar at Hopleaf. Doors open at 7pm, and the show starts at 7:30. It's free, and 21-and-over. Please RSVP on Facebook.